The vernal equinox is once again upon us, that means spring time is just around life's next corner! 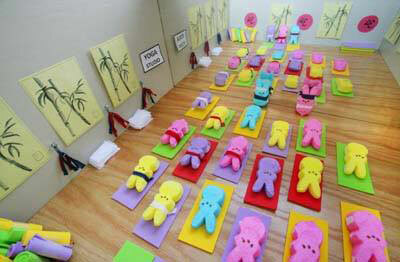 As always, we intend to celebrate...with yoga! Join us for 2 Hour 108 Salutation Celebration complete with sun salutes, moon salutes, chanting, and meditation. There are no rules and you are welcome to participant in any way that is meaningful to you. Above all, this is your chance to renew, re-connect, and refresh your body, mind and soul.....aaaah. **This workshop will replace the "Easy Like Sunday Morning Class" on this date. Starts at 11am. Spend a much deserved afternoon nurturing yourself. In this workshop, Geri will guide you, as you roll away tightness and tension in the muscles using foam rollers and balls, preparing you for a gentle, rejuvenating, yoga practice. Follow with stress relieving restorative poses for deep muscular release and relaxation. The class ends with a lengthy savasana for total release. Please bring a foam roller with you, tennis balls will be provided. Yin yoga is a form of Chinese yoga and works the six major meridians from the navel to the knees, this strengthens the immune system while stretching the connective tissue to release chronic held tension. The postures are all practiced on the floor and are held for 3 to 5 minutes. This enables one to harness the mind together with the breath to release more deeply into the body while tapping into the vast reservoir of vital energy within us all. While holding yin postures, some extra stretch or massage is added in, ending with a wonderful savasana massage on the neck, shoulders, and feet. Open to all levels. Starts at 2pm. Mats and props available. Wear comfortable clothing you can move in.